Republican senate candidate Linda McMahon has started her tour of Connecticut, USA by visiting female businesswomen in Southington. The former chief executive of professional wrestling company WWE (previously known as the World Wrestling Entertainment Inc.) lost her bid in 2010 and this time wants to meet with more voters one-on-one. Winning female votes is particularly important this time round as it was this demographic who tipped the balance in favour of Democrat Richard Blumenthal in 2010. “I think that as they get to know me and again are able to talk to me one-on-one or in small groups, they really do realize that I have shared a lot of their same issues, walked in their shoes,” said McMahon. She has received stern criticism from opponents who say her background in mainstream wrestling will deter female voters. The Associated Press found that 42 per cent of female voters said McMahon’s WWE experience made them less likely to vote for her. Only nine percent said it made them more likely and 49 per cent said it made no difference. Amongst the 42 per cent of those women who disliked McMahon’s WWE background, 86 per cent voted for Blumenthal and 13 per cent backed McMahon in the 2010 general election. Chairperson of the Connecticut Democrats, Nancy DiNardo, says she doesn’t see these numbers changing. 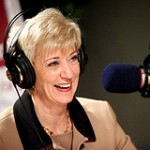 Did Linda McMahon actually wrestle?